This 72 year old woman said "enough is enough, I can't stand the pain or the way it looks any more". 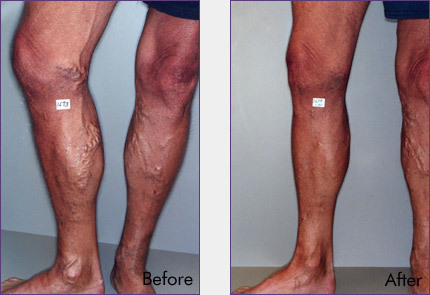 At the Vein Help Clinics we ligated Vein Ligation the leaking vein high up the leg near the groin and then the rest of the vein was micro-extracted with the Ambulatory Phlebectomy procedure. See the dramatic result in only 9 weeks. This 56 year old male had enough of his unsightly, painful legs and came to the Vein Help Clinics. We ligated Vein Ligation the leaking vein high up the leg at the groin and then the rest of the diseased veins were micro-extracted with the Ambulatory Phlebectomy procedure. He was so happy after one month that he couldn't wait to start treatment of his other leg. 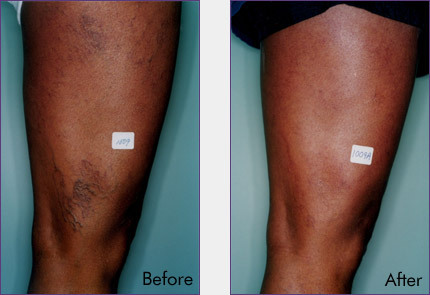 There were some residual cosmetic veins still to be treated around the inside of the knee. What a dramatic improvement in such a short period of time. This 53 year old teacher went to an orthopedic surgeon for knee pain and swelling. Her examination revealed that her problem was coming from her veins. She was referred to the Vein Help Clinics for treatment. We used a laser Endovenous Laser Catheter to treat the leaking (refluxing) vein in her thigh and micro-extracted Ambulatory Phlebectomy the diseased branches around her knee. Two months later her knee pain and swelling were gone. This 41 year old secretary came to the Vein Help Clinics complaining of aching, throbbing pain and leg cramps. 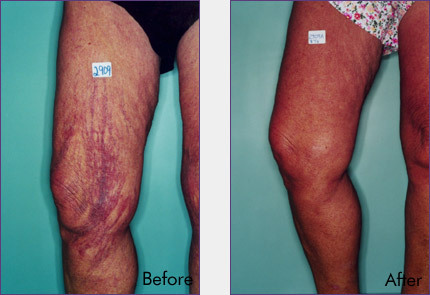 We used a Catheter Occlusion Procedure to treat the leaking (refluxing) vein in her thigh and micro-extracted Ambulatory Phlebectomy the diseased vein bulging out on the inside of the knee and calf. At two months you can barely see the micro-incisions along the inside of the leg. This 44 year old homemaker came to the Vein Help Clinics complaining of tired, aching, throbbing leg pain with swelling especially at the end of the day. We used a Catheter Occlusion Procedure to treat the leaking (refluxing) vein in her thigh and micro-extracted Ambulatory Phlebectomy the diseased veins bulging out on the inside of the calf down to the top of her foot. After four months you cannot tell that she had any problem at all. She was very pleased that all her swelling and pain were gone. 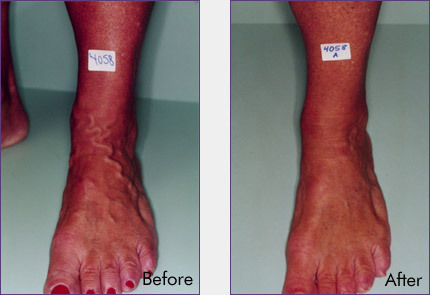 Unsightly varicose veins can also affect the feet. Six weeks after this vein was micro-extracted Ambulatory Phlebectomy this patient was able to wear sandals and flip-flops without pain and embarrassment. This 36 year old Afro-American female was extremely pleased with her results after 4 treatment sessions of simple injection Sclerotherapy. Now she could wear shorts and not feel embarrassed to go out in public. 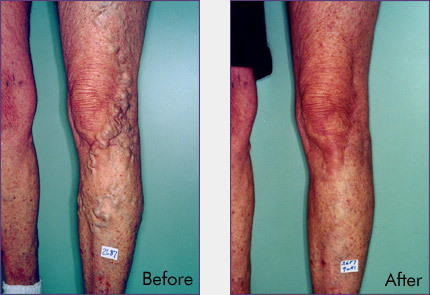 This 35 year old female complained of burning and itching along with her unsightly veins on the back of her legs. 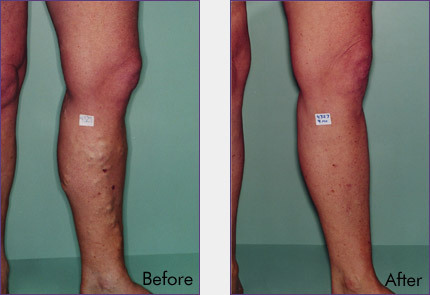 Great improvement with her symptoms and appearance was realized after just 4 treatments of simple injection Sclerotherapy. Unfortunately her insurance did not pay for any of the treatments even though she had discomfort. 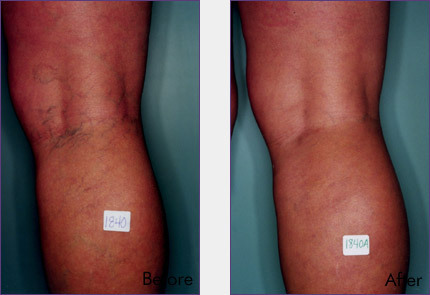 This 61 year old female had extensive spider veins with no symptoms. She wore pants or dark hose to hide her veins. 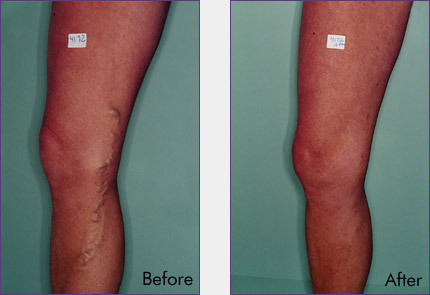 After 8 treatments of injection Sclerotherapy she was wearing shear hose and skirts to show off her great looking legs. The more extensive the problem the more treatments are required. 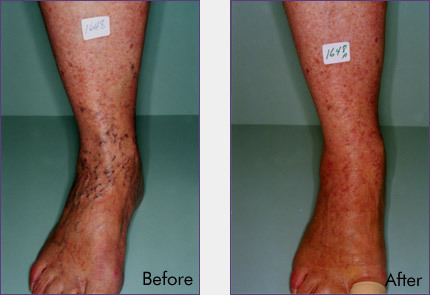 Spider Veins around the ankles are very hard to cover up. After 3 treatments of injection Sclerotherapy this patient was no longer embarrassed to wear sandals or walk on the beach.